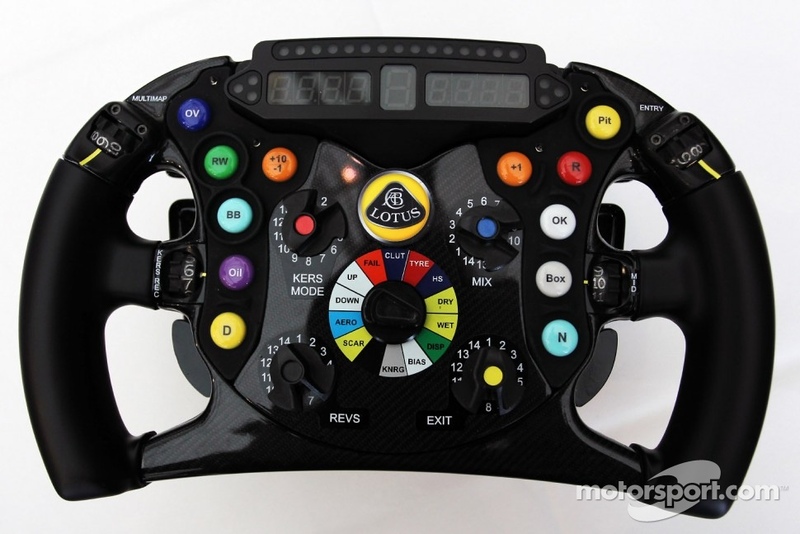 All of you know how many buttons there are nowadays on an F1 steering wheel. Very complex. I think 2 buttons in the early nineties right. Radio and Push to Pass which increased Revs ? I think the wheels got so complex with the ban of the two way telemetry. Ferrari 640, aka F1/89, introduced semiautomatic gears in the sport, notice the paddles behind the wheels. There's something very satisfying about on board footage from the old days, just a basic steering wheel and a manual gearbox, it's all so raw. I personally think it's a shame that we've gone from the wheels of the mid-2000s which a big screen and loads of handy data on it to the much more basic-looking button covered wheels today, it's like a bit of a step backwards. Agreed, these days it's much easier with most things electronically controlled. Back in the day drivers had to work much harder behind the wheel. I saw Prost's 1990 Ferrari in a showroom in Paris last month and was staring at the steering wheel for ages thinking how basic they were back then - just an engine kill switch and the pit-to-car radio. Today's wheels are just TOO complicated! Funny thing is you look at a modern steering wheel and think that there's a lot of buttons, but close to all of those buttons and switches have their own sub-menu systems. Haven't you contradicted yourself there? In times of yore, the drivers could just sit down, shut up and drive, now they have to deal with so much more; they have to manage fuel mix, they have to maintain their delta time as shown by the display, they have to check to see if DRS is available, they have to use KERS, they have to change brake bias (even between corners!) etc. Back in the day, driving required more "feel" for the car but was a hell of a lot less complicated! Last edited by Pedrosa_4_Ever on Mon Dec 24, 2012 7:16 pm, edited 1 time in total. Haven't you contradicted yourself there? In times of yore, the drivers could just sit down, shut up and drive, now they have to deal with so much more, they have to manage fuel mix; they have to maintain their delta time as shown by the display, they have to check to see if DRS is available, they have to use KERS, they have to change break bias (even between corners!) etc. Back in the day, driving required more "feel" for the car but was a hell of a lot less complicated! That's a strange smiley to use then! It is just a proof that driving in an older car is easier (if not much) than the current car. Simple.